This is not your fathers BB gun. We sell Ekol of Turkey C02 Propelled air gun BB Guns exclusively. Ekol manufactures some of our best blank firing gun models. Ekol is well known for their years of expertise in precision quality replica gun design and manufacturing. Like our blank guns our Ekol C02 Propelled BB guns are made with all metal construction instead of plastic. Many BB gun models on the market are actually made of plastic. Each Ekol BB Gun is expertly crafted, manufactured with great precision then tested to exact tolerances before they are approved for sale. The Barrels of our BB Guns are a precision Rifled Metal construction inside the Barrel. As with a real Fire Arm, Rifling in the Barrel is what makes a projectile (BB in this case) fire straight by spinning it like a football. A rifled barrel is the only way to really get an accurate shot and improve your aim. Our BB air guns are CO2 Propelled using C02 Cartridges that fire 4.5MM BBs at a velocity or speed of 360 Feed per second. That is the more than the length of a football field in less than a second! Because of their accuracy our Ekol C02 powered BB Guns are used by Fire Arms Hobbyist and Target Shooting to improve Hand Gun aim with less expense. Ekol BB Guns are much safer and quieter than target practicing with an actual live fire Pistol. 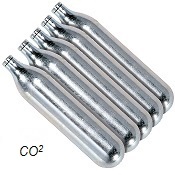 The CO2 Cartridges and BBs are sold separately and are also available as an option as you add your BB Gun selection to your shopping cart. We are very proud of our new Ekol BB Gun addition to our Replica Weapons line and are certain that you will be well pleased with your purchase of our Ekol C02 BB Guns. Scroll down to view our Ekol C02 Propelled BB Guns.